How Not to Get Shot is a satirical look at the influence of white people's interpretation and advice regarding how Blacks can protect themselves from whites. Based upon the power of white privilege coupled with the affects of supremacists over the escalation of murders of Blacks in these times, Hughley speaks of 1. What the transparency of white-consciousness has taught him. 2. How revealing white's ignorance about racism truly is. 3. Regardless of exposure to integration many whites' remain clueless regarding cross-cultural norms 4. White's denial of their power due to white privilege is deadly 5. As has been the case for 400 years Blacks are paying attention and do know what they know about white's and we (whites') need to listen. While interviewed in a program in which Hughley was lectured about Philando Castile's murder, the white interviewer gave suggestions on how Castile could have prevented it. This took Hughley by surprise yet resonated with what many white people have done to him before. It is called blaming the victim. Hughley took it as an opportunity to begin to write a satirical book in which he suggests Blacks pay attention to white's advice even when … no, especially when it is ridiculous because it reveals many layers of white denial and how white's especially are unconscious regarding the danger inflicted upon Blacks, due to white privilege. The transparency of the arrogance of whiteness is something you may not be able or willing to laugh about. Either way if you are informed or aware you will recognize the systemic and institutionalized racism which has impacted all of us. As a result, we barely know one another. We talk 'at' instead of talking to each other. We are afraid of one another. We cannot trust one another. Some of us, all of us, just sit back and watch our lives unfold as if we are watching a movie. This is how deeply effective our racist training has been and this extreme passivity is the cost of white privilege just as the witnessing of, and for some participation in crimes against Blacks is the intentional affect of complicity. In How Not to Get Shot Hughley crystallizes the distinctions between white and Black: how one dresses, what kind of car you own, what to do in a crisis, how one parents even down to names we choose for our children or what kind of music we listen to and so much more. It is appropriate for the sixteen and over club, could be assigned reading in any H.S. curriculum. Is 257 pages with 5 Parts, 29 chapters, an introduction, acknowledgment and epilogue. As the noted African American writer Langston Hughes once said "Out of the manure that American society can often be for black, men, the growth and beauty of their genius cannot be suppressed. Cannot be denied." 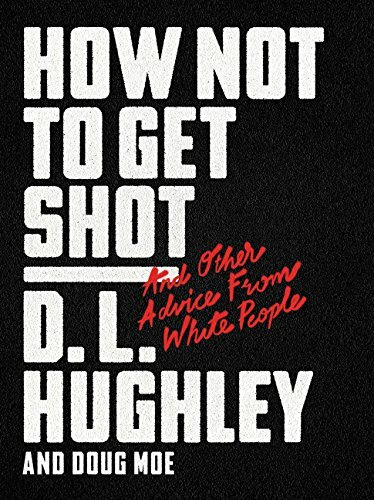 That said, the brilliance of D. L. Hughley and Doug Moe in How Not To Get Shot: And Other Advice from White People must be both affirmed and recognized!